These following group of pages will display the brief history and meaning of the family names in our genealogy. Coats of Arms or Family Crests have been a symbol of a family's values since times of old. Originally used to identify a warrior knight who was dressed in armor. Some Knights would choose symbols and/or colors to distinguish their armor in battle, since nobody could tell who was inside the suite of armor. These symbols were then passed on from generation to generation and became known as a "Coat of Arms". A Coat of Arms is also sometimes referred to as a Family Crest, Family Shield, Code of Arms or Arms. 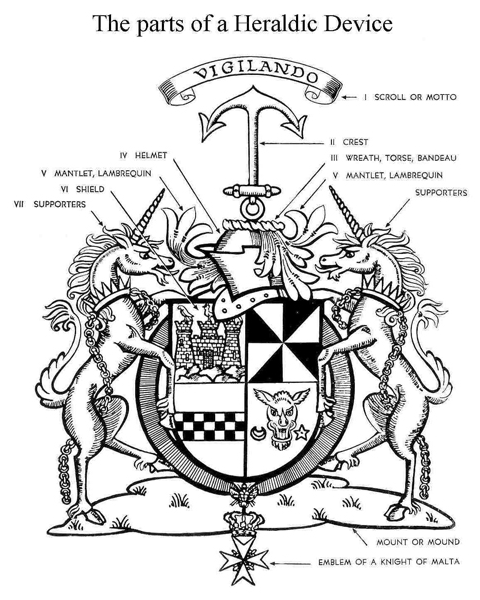 A coat of arms is a time honored, graphical display and history of your family surname. Displaying authentic Coats of Arms is a tradition that has withheld the test of time dating back over 750 years. Displaying a Heraldic or Family Crest item can provide an individual with a greater sense of purpose, not only for you, but also for your family members, while emboldening family unity. Displaying an official Coat of Arms, Family Crest, Heraldry, Surname, Genealogy, or Family History item serves as a constant reminder to the bearers of that surname that they have a direct responsibility to uphold the traditions and honor of their family surname. Sometimes we will include some personal anecdotes and extra information here.